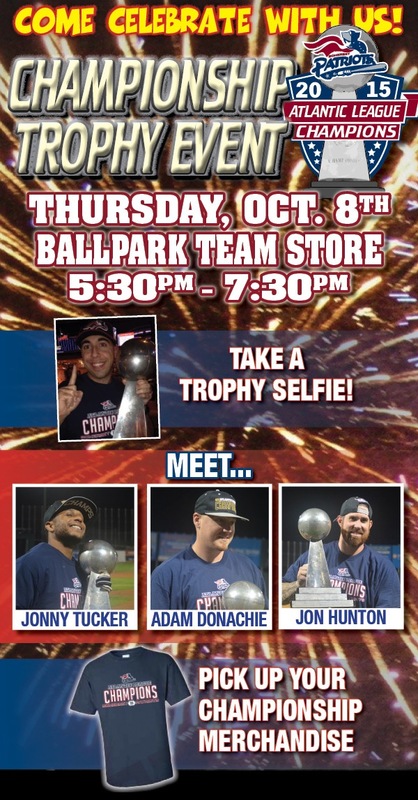 Tomorrow night, Thursday, October 8th, the Somerset Patriots are inviting fans to celebrate the team’s 2015 Atlantic League championship with them. Fans will be able to meet select players from the 2015 championship team, take pictures with the trophy and buy playoff merchandise. After losing game one of the championship series to the Southern Maryland Blue Crabs a week ago tonight, the Patriots ran off three consecutive wins (interrupted by a pair of rainouts) to capture their sixth title.